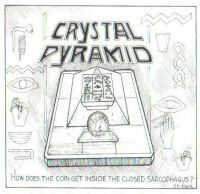 A small alter, in the center of which is a closed box, and covered with a crystal pyramid. 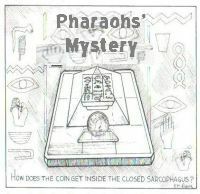 A borrowed coin (which may be marked) is placed on the altar, outside of the pyramid. Now it is time for the powers of darkness to do their magical work. The pyramid is covered with a small handkerchief, and a moment later. 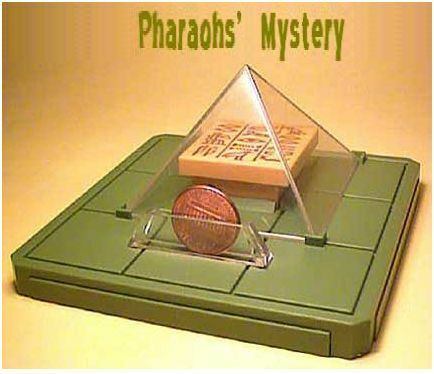 The same borrowed coin is inside the box inside the crystal pyramid! Most mental magic is not visual in nature. Tomoyuki Shimomura searched for a way to make mental magic visible, and finally came across a spirit box-type effect. In this type of routine, a curtain is closed in front of a large wooden box. As soon as the interior of the box is out of sight, spirits appear inside the box and perform several mischievous acts, such as placing a ball inside of a cup. Various conditions were imposed on this trick, such as able to be performed close-up, with a coin, and the gimmick must be built-in, and must be operated with a single touch. After working out the construction principles involved, we decided to perform this trick with a lid that is shaped like a pyramid. This decision also introduced the intriguing presentation used today.